The decision for a Scrapbook Photos page can come about in many ways. In the fall of 2011, I received a phone call from Cody Allison (her real name is used with permission) from Sacramento, Kentucky. She seemed a little surprised that someone actually answered the phone. As she explained, I understood. 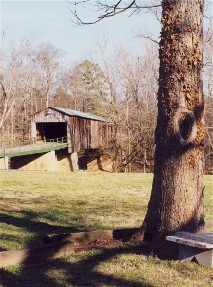 In a visit to the Euharlee Covered Bridge, she had discovered one of my Poetry & Pictures books in the small museum there. One of the poems connected with her, and when she noticed the phone number in the back of the book, she decided to try it. That book was from before my digital days. I had no website, nor even email. Sometimes I would carry a small supply of books (see Poetry & Pictures index photo) I had made up to give away as gifts as we traveled. At other times, when someone was particularly helpful or kind, I would take their name and address and send them a book I created using the pictures I took at their particular location. I believe the Euharlee book was one of these. At any rate, Cody's call brought back some pleasant memories, and added some new ones. As long as the Euharlee Bridge was on my mind, I figured why not pull out some of the 35mm photos I took, do a little scanning, and create this Scrapbook Photos page. I did not shoot many pictures there though. We were actually on our way back to Woodstock (where my mom and sister live) from the Etowah [Indian] Mounds. We stopped for a little while at the bridge, and then, closer to Woodstock, at the Sixes Road Mill. Etowah will someday have its own page, but I thought I would include the two stops, and a couple of pictures from along the way, together for this page. 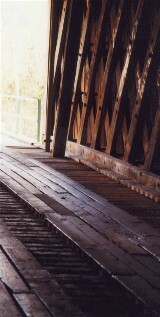 Our visit to the Euharlee Covered Bridge was on March 2, 2000. I had already established the Teaching & Sharing Center some years prior, and was seeing life from a far more spiritual perspective. So, by this time, I was considering my photography and poetry as my primary vocation and mission tool. My recollection is that the woman at the museum was a knowledgeable elder. She was informative, helpful, and accommodating. I would have typically sent the book to her personally, although by 2000 I had stopped cataloging the books I gave out and have no notes what was included in it or what her name was. I am guessing she most likely donated it to the museum. I believe we only visited the bridge. Having already spent a good portion of the day at the Etowah Mounds, we did not take the time to explore the historical district of the town. 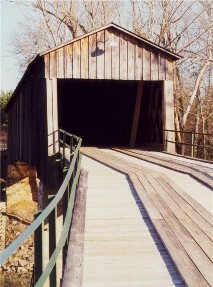 But, according to their brochure map above, there appears to be a number of things to visit besides the covered bridge. I have reproduced the full text of the brochure, picked up in 2000, providing descriptions of the various places on a separate page linked to the map. Just click on the map to see that text along with other bits of information gleaned from the Internet in 2012 when I prepared this page. Much of the advertising for the City of Euharlee bears the slogan: “She laughs as she runs” - Cherokee. One of the websites I visited (http://www.notatlanta.org/na/Euharlee,_Georgia) further explained: "Euharlee derives its meaning from the well-known Indian name Eufaula, meaning, she laughs as she runs. The area around the small town of Euharlee contains archaeological evidence of earlier Indian civilizations. 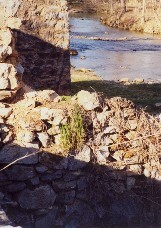 Present-day Euharlee was settled in the 1840's in the presence of several mills and was called Burges Mill. 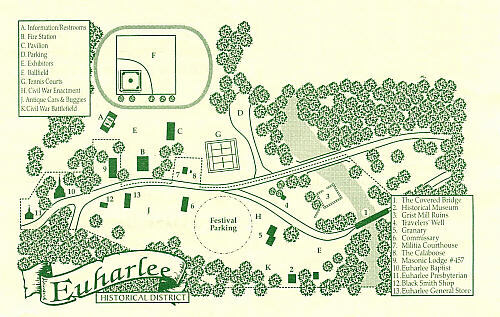 In 1852, the town was incorporated as Euharleeville and in 1870, a new charter established Euharlee, pronounced U-harley." The Cherokee removal (Trail of Tears) took place in 1838-1839, so the town's founding apparently followed upon the heels of the removal. Prior to that the whole area would have been part of the Cherokee Nation. 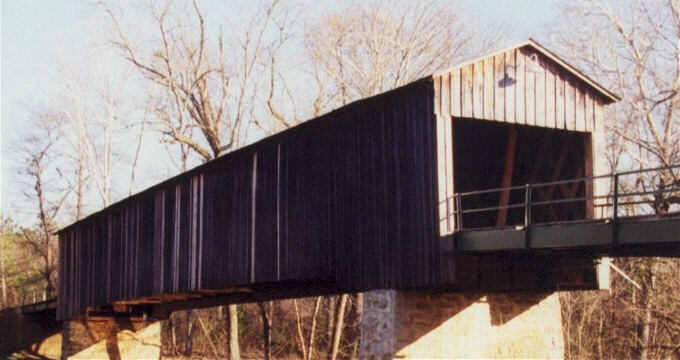 In 1886 the county contracted with Washington W. King, son of freed slave and noted bridge builder Horace King, and Jonathon H. Burke for the construction of this 138-foot bridge. 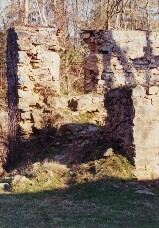 It was adjacent to a mill owned by Daniel Lowry, of which the foundation is still evident. 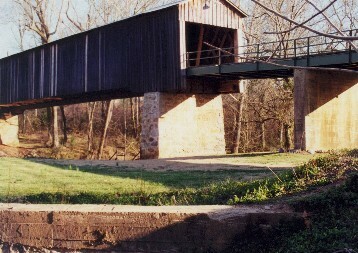 This bridge replaced several previous structures, the last having been built two years prior. 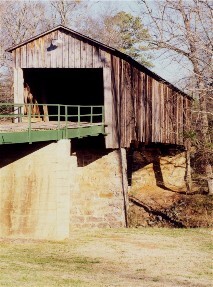 Constructed in the Town lattice design, the bridge’s web of planks crisscrossing at 45- to 60-degree angles are fastened with wooden pegs, or trunnels, at each intersection. When I am traveling, old barns and outbuildings, whether or not in current use, are favorites of mine. Still, sometimes the modern causes me to pause to take a picture, partly because of the contrast. On really nice days, even with my old Canon AE-1, I could snap a photo from a moving car, but in those 35mm days, I did a lot more stopping. Today (my wife just says she will drive and) I have to get the shot at whatever speed we are traveling as we are going by these "along the road" subjects. I think maybe she tired of long travel times for short distances. Having several images of the same thing to choose from is the giveaway that we stopped for these. I was probably driving. If I had visited Euharlee in my digital days, I would have way more pictures of the bridge from different angles. 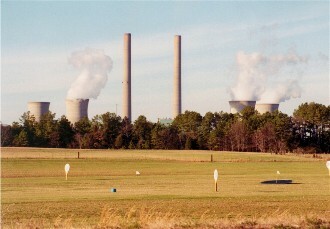 I would have pictures of the grounds and surrounding areas. And, I would have pictures of the small museum, both inside and out. But, in the days of 35mm photography when I had to buy film, then pay for the processing of each picture I took, I was a little more frugal about what I shot, particularly with inside pictures. So, my stop at Sixes Road Mill and the images I have from there are a bit . . . hmm . . . shall we say . . . extravagant. I apparently really wanted to be sure I got a good photo of Sixes Road Mill, because I took two pictures at the end of one roll. Then I shot a whole roll of 24, out of which I managed to squeeze a 25th image. Then I came by the next day as we were heading north and added another six photographs with better sunlight. That adds up to 33 photos. In and of itself, that would not necessarily be unusual, except in this case they are somewhat all the same image. 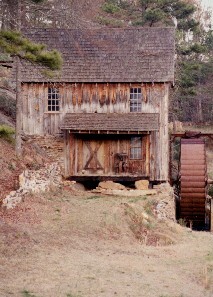 Sixes Road Mill sits on private property, so it is not accessible to go exploring from different angles, or up close. Basically, you get to take pictures from the road, which I did . . . and did . . . and did. At the time, I even had no idea what its story might be, although, as it turns out, it is fairly significantly tied into Cherokee history. On this day (March 2, 2000) it was just something picturesque. 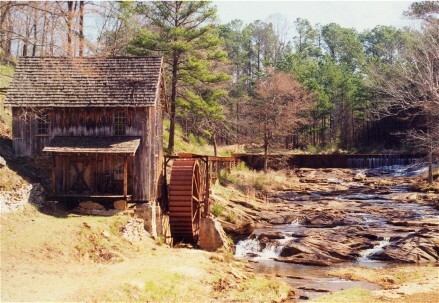 As I was researching this page through the Internet, I discovered Sixes Mill is the site of one of the earliest settlements in north Georgia. The mill that stands today was rebuilt between 1878 and 1880, but there is much more to the story. From Wikipedia (http://en.wikipedia.org/wiki/Sixes,_Georgia) . . .
"Sixes is an unincorporated community in western Cherokee County, Georgia, United States, located about three miles west of Holly Springs and near the eastern shore of current-day Lake Allatoona. 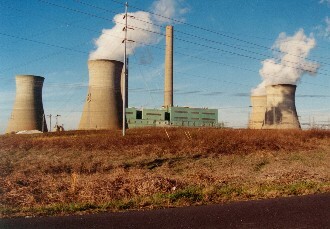 The community is located in the Georgia Gold Belt, which runs southwest to northeast along the southern edge of the Blue Ridge mountains. 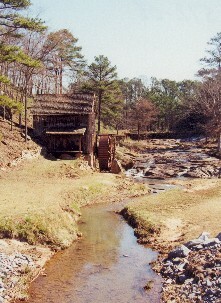 The Sixes Gold Mine, a now-defunct gold mine dating back to the early 19th century, was located just to the northwest. 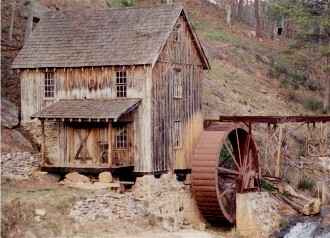 In addition, the community is home to the Sixes Mill, which was originally built around 1820 by early gold prospectors and later rebuilt around 1880. 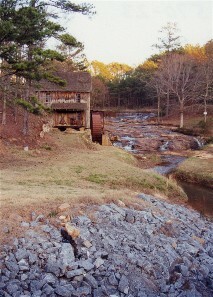 The mill has been well-preserved and is still located off Sixes Road. There are two theories on how Sixes derived its name. The first theory attributes the name to Fort Hinar Sixes, a Cherokee Indian removal fort that was located in the area along the infamous Trail of Tears. The second theory holds that the name is derived from an old Cherokee village that was located near the Etowah River named "Sutali" — the Cherokee word for the number six. 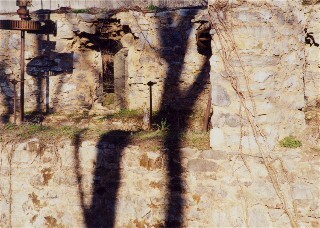 Sixes also lent its name to Fort Sixes, an 1830s US Army fort that served as a removal collection point for Cherokee prior to the Trail of Tears. Sutallee, a community that sits on the opposite side of the Etowah River (now Lake Allatoona) in western Cherokee County, also derives its name from this Native American village." 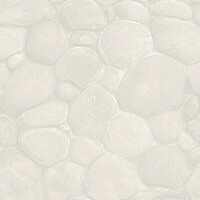 From (http://roadsidegeorgia.com/site/sixes_mill.html) . 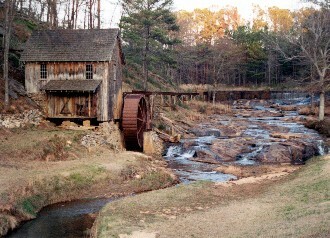 . .
"Perhaps as early as 1819 a group of white gold miners lived on or near the site of Sixes Mill. Although no mention exists that they were mining gold, it is very likely that they were. This was at the southern end of the gold belt that runs through Dukes Creek. In 1830 federal troops reported an established community of settlers. It is possible that a mill existed on this site at this time." "After the gold land lottery (1832-33) a mill was constructed to serve the needs of the local farmers. The mill survived the Civil War, and in 1878 the Marietta and North Georgia Railroad began to build a railroad through the county from Knoxville to Marietta. 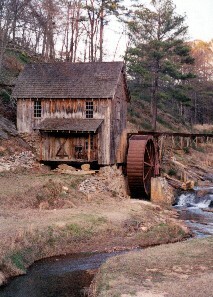 It was during this time that the mill was almost entirely reconstructed, including the addition of the iron mill wheel." If you have visited any of my Cherokee history pages you might already know that Georgia had held a land lottery to grant properties located within the Cherokee Nation to Georgia citizens, years before it actually had any rights, even fraudulent (see the New Echota Scrapbook Photos page), to the land being distributed.